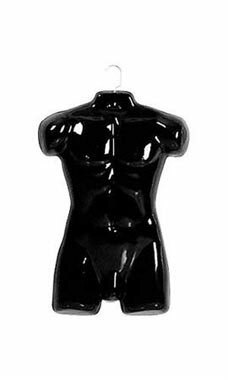 Black Economy Men's Torso Form with a Hook is an economical and effective way to showcase your merchandise and swimwear. The fashion forms are very flexible and feature a shiny finish that accentuates the details of the form that allows it to be visually appealing. The form is made from shatterproof plastic and features a half-round, open-back plastic shell that allows clothing to be pinned and synched. Fashion forms are easy to dress and can display top and bottom merchandise. Fashion forms lay flat against display walls and free standing units.